My favorite non-book publication to read is National Geographic Magazine. The day it comes is definitely the most exciting mail day of the month! I lose miserably to Adam…every month… on the geo-quiz, but even that doesn’t temper my enthusiasm. No matter what else I may be reading when it comes, I pause and read the magazine, almost always cover-to-cover. I think for awhile after I started staying home with the kids it was the only way I felt intellectually connected to the world. For me, reading the magazine gives me the opportunity to learn about so many varied things and has really provided me with the means to stay “aware.” I can credit the magazine for teaching me the existence of such disparate things as Boko Haram—a Nigerian terrorist group which earlier this year pledged its allegiance to ISIS—and sea wolves (more below)! I love the magazine so much, I’m thinking—assuming you all find it interesting—that I’ll come post highlights of what I found interesting or enlightening from each month’s issue of the magazine. Mystery Man (on the cover, Almost Human: A New Ancestor Shakes up our Family Tree) — This month’s cover story is AWESOME. Basically, paleoanthropologists have discovered a new species of homo, disrupting the previously-held notions of how homo sapiens evolved. It’s an especially cool story because they bones were discovered by two random cavers who just happened to be skinny enough to drop into this previously-unexplored part of a well-known cave in South Africa. I love human bones—my favorite class in college was forensic anthropology—and human evolution has always fascinated me. It’s an area where science and theology have so much left to figure out. One of the greatest quotes in the article comes from an anthropologist: “What [this new species] says to me is that you may think the fossil record is complete enough to make up stories, and it’s not.” Basically, we don’t know the whole story of when/how humans came to be. There’s so much more to learn! Sea Wolves – There are wolves in Canada who live entirely on food they find from the sea. It’s a whole new way of thinking about wolves; there’s even enough genetic diversity between them and inland wolves to consider them an “evolutionarily significant unit” worthy of conservation. I’d love to hear what you think about these articles, National Geographic in general, or, really, anything! We’ve been getting it for years as a gift – so awesome. My kids have learned a lot from looking through the pictures, like you did. We save all the issues, so let me know if you want to borrow! Another cool thing about the Homo naledi discoveries is that it was an all female team who confirmed the find & retrieved the specimens -they had to be small enough to fit in the cave! NatGeo is a great mag. If you get a chance tune in to NPR every now and again -NPR keeps me informed, especially in the mornings. Plus, they had a fascinating interview with one of the women who participated in the expedition! On another note, I wonder how the sea wolves will fare in light of global climate change -keep us posted if NatGeo does a follow up! I thought that part about the all-female team was awesome. 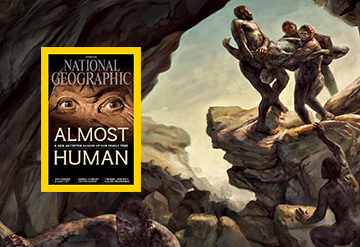 I also love that they included the cavers in the research – one of them is pictured in the article. Apparently the sea wolves used to be all up and down the west coast of the continent, but humans wiped them out. Now they’re only in British Columbia and southeastern Alaska. The article doesn’t talk about climate change, but does mention a proposed energy project that would be disastrous for the wolves. Local First Nations communities are trying to stop it, but whether they’ll be successful remains to be seen.